Festooned with natural beauty and piety in ambience, the holy town of Tirupati is a call to pilgrims in every corner of the world. From here, they reach to the hill town of Tirumala 20 Km away that houses world famous Lord Venkateshwara Temple. Also known as temple of Tirupati Balaji, it is positioned on Venkata Hill, one of the Saptagiri (seven hills) of Tirumala Hills, surrounded by Eastern Ghats. The seven peaks are believed to be seven hoods of Adishesha / Sheshnag, the Serpent God cushioning Lord Vishnu. Being one of the most worshipped temples in India for all devout followers of Lord Vishnu, it makes this city of Chittoor district in Andhra Pradesh a centre of religious and cultural heritage. The holy city dedicated to Lord Vishnu is dotted with numerous other temples that are regarded high by the pilgrims who come to get a glimpse of him as Lord Venkateshwara. Anything and everything associated with the Lord becomes venerated, thus making the town one of the most visited religious places in the world. The temple is situated at 2,799 ft which only adds to the beatific appeal of the second richest temple in the world, first being Padamanabhaswamy Temple in Thiruvananthapuram. The history of the city has been almost always associated with that of Lord Venkateshwara Temple but their origin is obscured by the layers of antiquity. Constant devotion of the rulers of various Southern dynasties in different centuries has kept the revered destination intact, as pilgrims witness it today. Pallavas, Pandayas, Cholas and Kings of Vijaynagar Empire were the main contributors who added to the wealth and value of the temple. The biggest addition was made by Krishnadevaraya who also got gold statues of himself and his wives installed in the temple. The enhancement of wealth was continued by the other Hindu rulers like Ragoji Bhosle. The treasure of the temple is growing since then as pilgrims give away a part of their riches in devotion to the Lord Venkateswara. Deities of Temple include Dhruva Beram, Kautuka Beram, Sanapana Beram, Utsava Beram and Bali Beram. Each one of them are worshipped through vastly different rituals which is also something of interest to the tourists and pilgrims, making the temple the most visited worship place of the world. Its riches and treasures are second only to Sree Padamanabhaswamy Temple in Thiruvananthapuram. 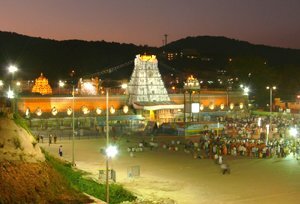 Tirumala Venkateswara Temple: The temple has striking architecture with gold plated Vimanam, the tower housing the main deity, Bangaru Vakili, Padi Kavali and the Vendi Vakili and Garbh Gruha. Numerous Vaishnava festivals are celebrated here which draws even more crowd of pilgrims to the place. The presiding deity, Lord Venkateshwara is believed to be staying here until the end of Kaliyuga as per a legend. So, everyone can enjoy company of Lord till the end of the eternity, availing special Seva by purchasing tickets or free Dharma Darshana. Silathoranam: Resembling conch, discus and a serpent with hood much like Adishesha who is often depicted supporting nether of Lord Visnu, this natural rock formation is given immense importance for it antiquity. Different theorists have unique suggestions pertaining to existence of these formations. Kapilateertham: Among all the temples in Tirupati, this one is dedicated to Lord Shiva. Located at the foothills of Tirumala, the temple has a tank in which pilgrim take a holy dip before proceeding to visit Lord Venkateshwara temple. 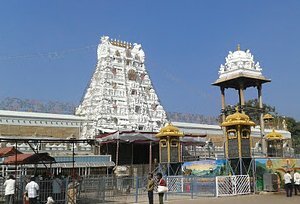 Govindaraja Sway Temple: With a prominently visible Gaali Gopuram, the temple is located near to the Railway Station of Tirupati. The temple complexes houses idols of many deities in addition to Swamy Govindaraja. Duration of May and June attracts pilgrims from all over India to witness the festival of Brahmotsavam. Sri Kodandarama Swamy Temple: Dedicated to Lord Rama, a highly revered incarnation of Lord Vishnu and his wife Sita, the temple marks the return of the divine couple from Sri Lanka. They were believed to have stayed here for few days after their return, making the place sacred for their devotees. Sri Kalyana Venkateswaraswami Temple: The temple is believed to be marking the mythological event of wedding of Lord Venkateshwara and Padamavathi Devi. Narayanavanam, the location of the temple, is thus visited by the pilgrims who strongly believe in the legend. By Air : Reniguta is the nearest domestic airport where as Chennai is the nearest International airport to reach Tirupati. Taxi services could be availed to reach the holy destination only 138 Km away, thereafter. By Train : Connected to all the metropolitans like Delhi, Bangalore, Chennai, Vishakhapatnam and Madurai by rail, Tirupati is also reached by Reniguta a major railhead just 15 Km away. By Road : Services of the buses plying on different routes reaching Tirupati could be taken in addition to hiring taxies or renting cars.